What are Web Intelligence Sections? In Business Objects XI Web Intelligence sections are easily created and often even by mistake (drag a single object to the report and you will see what I mean). They can be made more complex and wider (taller) with greater scope. Sections apply to the entire horizontal area of page over which they are defined (best viewed/managed in Structure View). In other words, you can have multiple tables, graphs, cells in a section if you want. The section is also defined usually by a dimension so that each unique value of the dimension becomes an instance of the section in which all content placed in the section is repeated. All of the content in that instance is filtered to that unique dimension value. So what are Breaks then? A break is something that I rarely seem to get these days. No seriously, a Business Objects WebI report break has similar properties to those of a section. It is a sort of pivot around each distinct value of a dimension or formula. However, a break occurs only in a single table/block. Breaks cause the table to be broken up in instances of the break, sub-tables usually. These are easily created, usually by highlighting the desired dimension’s column and then right-clicking or section the top-menu icon. Sections can be applied and formatted to function more or less like breaks; however, breaks can never function as sections do, they are limited to the scope of the block on which they are defined. I tend to prefer sections as they allow for greater flexibility and they seem to have more options. Nevertheless, breaks can be excellent for grouping relatively small amounts of data and then aggregating the measures at the bottom of the table. Personally I would love to hear you all opinions or observations on this topic. Please share openly in the comments. so if you want to “break” your chart into groups you will have to use the section. 2.With section it is much easier to understand data in hierarchal view since the sections can be placed under each other. 3. In sections you get an easy navigation through the map, in breaks you don’t. 4. In breaks however if you filter out a specific value in the break, the break will disappear, in sections, the section will stay, leaving the report with sections that you don’t really want to see since the section value remains. Excellent points! It reminds me to that the section’s navigation map actually exports to PDF, breaks have no such thing. By the way, breaks can be nested hierarchically as well. I find breaks handy on simple reports (usually just one table) with a hierarchical display, such as department, team, employee. Since many of our reports are distributed vie Excel, the data is easier to navigate when it’s in a single table with subtotals (per department, for instance), rather than have a section header every few rows. I have sections that span across multiple pages per distinct value. I would like to be able to display a page count per distinct value such as if it spans 3 pages it would say page 1, page 2, page 3 then when there is a new value for the section the count would reset. Does this make sense? Is this possible? Thanks. Hi Chris, I don’t think that is possible, well maybe I don’t really understand. Nevertheless, the “Page” functions in WebI are not very powerful, they are strictly total page counters and they cannot be bound to sections. Sorry. I think its a bit late reply but just want to comment that PageInSection() function can solve Chris Houser problem. how to display sections in vertical level? You can apply alerters to section cells. the first row of that break.If condition appear on any other line within the break, the alerter is not applied to the break cell. Hi ram, if you are asking if it is possible to create sections in vertical columns in stead of the usual horizontal fashion then the answer is that this is not possible. Perhaps you could use a break on a top dimension in a crosstab to achieve a compromise of the effect. One disadvatage of section over break is that we can’t get Grandtotal when using section with Cross tab. is it possible to apply section & break on a single objects? Hi Vishal, even if you could, how would you use that? The Section is already a block that is filtered so that the data inside is only of that object (dimension). If you put a break on it, there should be no change in the visual representation. Is it possible to apply sections “horizonatly”. For instance I have sales report which shows sales information of different branches. If I put all branches in one page, total length(vertical length) of the report will be extremely long. So I want divide report into different tabs/pages. I duplicate the report for each branch and then change the filter values. Instead of changing filters, I want to apply sections to different tabs. How can a section be un done? How many sections can we used in report? Hi Syed, to delete a section in WebIntelligence you can right click in a blank space in the section and select the option to delete it. 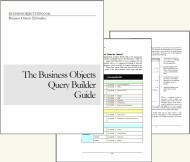 Hi Anji, there is no limit to the number of sections you can put in a Business Objects WebI report. I do wonder why you are asking this question. Came to know many new things from this webpage about Breaks and Section in Webi. Its Cool and Interesting. In simple terms i can define these two as Breaks can only be applied over a particular block and Section in other hand can be applied on the entire report. When we represent data in the chart/graphical form then the best practice is to go for section rather then Block.